Chanelle Adams approaches her research as a hybridization of history, the biological sciences, poetry and STS theory. During her undergraduate studies at Brown, she researched epistemologies of Malagasy healing with a focus on the circulation and use of plant materials in Madagascar. Chanelle launched a feminist web platform, Bluestockings magazine, after which she became Managing Editor at Black Girl Dangerous. In 2017 she accepted a Fulbright Fellowship and enrolled at the Ecole des hautes études en sciences sociales where she completed a Masters in comparative social sciences. Currently she is doing archival work in the herbarium of Marseille’s Colonial Museum with specific attention to the materials of Madagascar’s pharmacopoeia. “Pharmacie gasy: The neocolonial insturmentalization of toxicity to discredit healing in Madagascar,” for The Funambulist issue on Toxic Atmospheres October, 2017. “Devenir Materia Medica: le Musée colonial de Marseille, Dr. Heckel et la construction de la valeur des matériaux médico-botaniques malgaches (1893-1916),” Master’s Thesis, Program of Research in Comparative Social Sciences, Ecole des hautes études en sciences sociales, September 8, 2017. 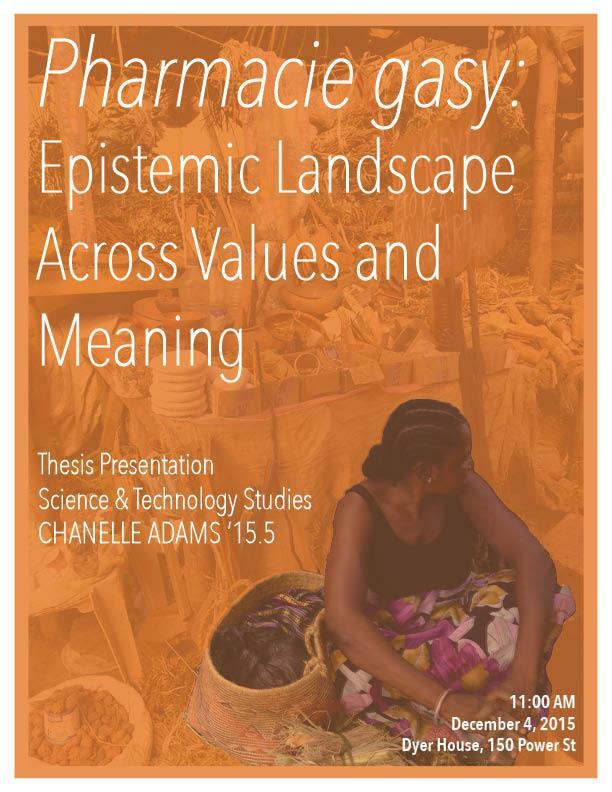 “Epistemic Landscape Of Northern Madagascar Across Values and Meaning,” Honors Thesis, Program of Science & Technology Studies at Brown University, December 5, 2015. “Paradise​ ​in​ ​Peril:​ ​​​The​ ​Moral​ ​Values​ ​of​ ​Environmental Conservation​ ​in​ ​Madagascar​ ​From​ ​1894​ ​to​ ​2017,” paper for “Moving Beyond Paternalism: Supplicants, Saviors and the Politics of Anti-Slavery and Anti-Trafficking in Africa” at the University of the Witwatersrand, Johannesburg, South Africa, November 29 to December 1, 2017. “The politics of pharmacy-gasy in Madagascar,” recorded in Paris for The Funambulist Podcast on March 14, 2017. “Gender, health, commodity, and trust: Marketplace of pharmacie gasy in Diego-Suarez, Madagascar,” presentation at Pembroke Center for Teaching and Research on Women, Brown University, June 2016. “Researching With/Through Community: Cognitive justice for medico-botanical practitioners in Northern Madagascar” invited presentation for undergraduate Brown University Africana seminar “Activist Scholarship: Research and Writing for Social Change” at Brown University on March 14, 2016.